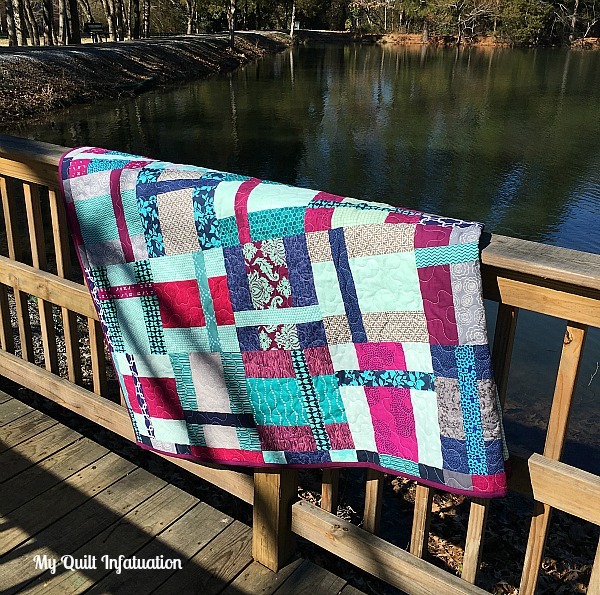 When someone has very specific colors in mind for a quilt, I always ask for photographs including the colors and style they like, or I even have them create a pinterest board to be sure that the vision they have in their mind matches my own. 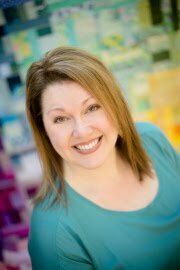 Color can be so tricky to describe with words, because descriptors like light, soft, dark, deep, bright, and muted are so subjective. The way these words are interpreted can change the look of the entire quilt. Lately, I've found that asking for paint chips in the desired colors is a great way to make sure that the colors I include are exactly what a client wants. While shopping for fabric, the paint chips are easy to hold against the bolts to make sure that my choices are just the right shades, and I can keep them clipped to the project notes in my planner so they're always at hand. Another great thing about the paint chips is that they also include several shades within the same color family. 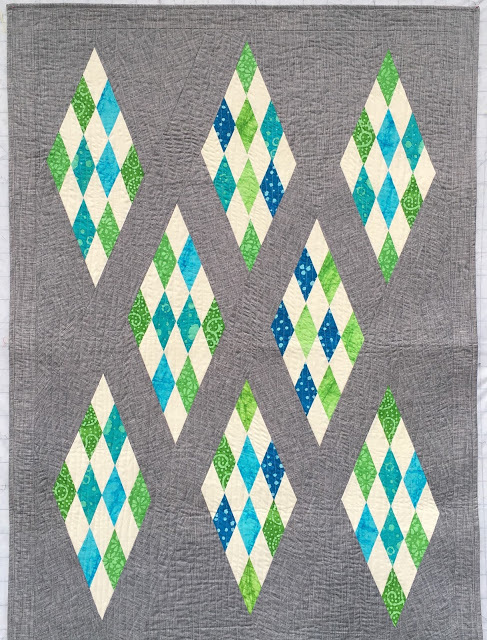 We all know that without some variation in colors, a quilt ends up looking flat, so those additional shades are important to give the quilt enough contrast. *Edited to add (since several have asked, and I can't believe I forgot to mention it)- Yes! 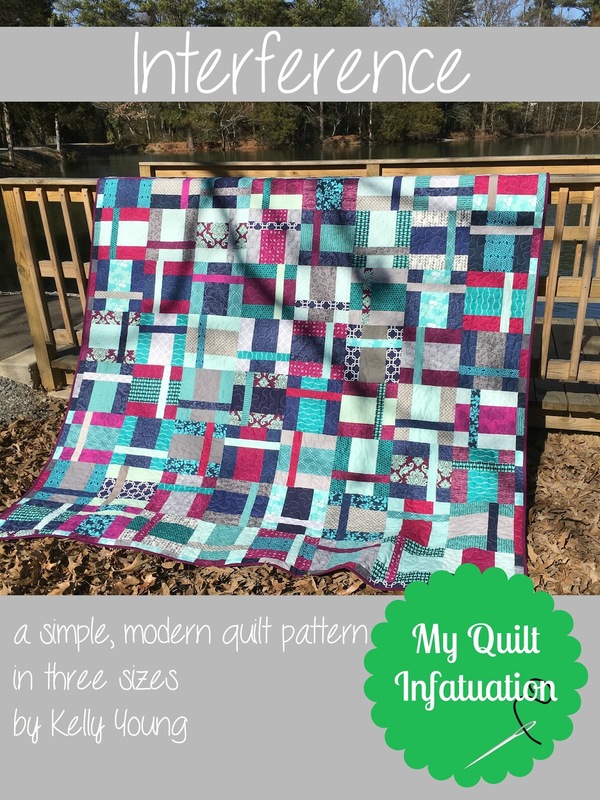 I am already working on the pattern for this quilt! I am calling it Interference. 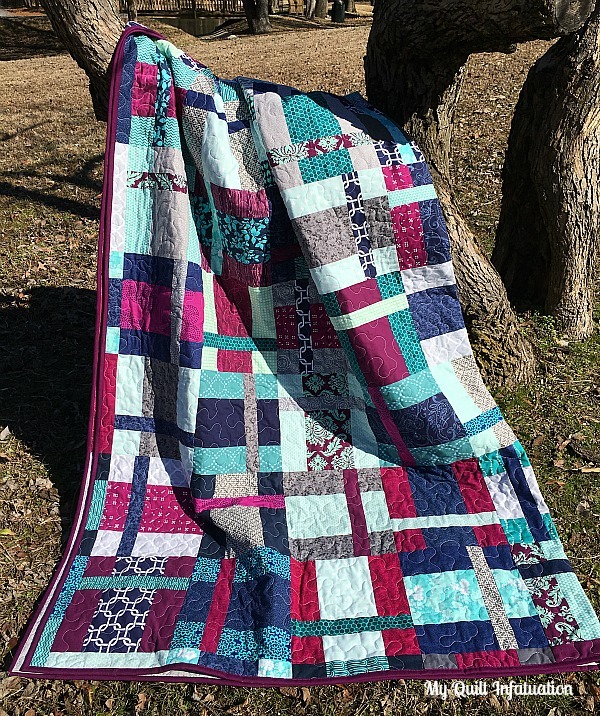 The paint chips for this quilt included navy, aqua, teal, and gray, but my friend asked if I could include one additional color to add some pop. I gave a few options that I thought would look pretty with the palette, but we both decided that this shade of rich berry was perfect. Berry is a tricky color, because it's hard to go lighter without it looking too pink or purple, but I do love how well these colors play together. I can't wait for her to see it! There was all kinds of awesomeness linked up at last week's NTT. Here's a little sampling some of that amazing creativity! 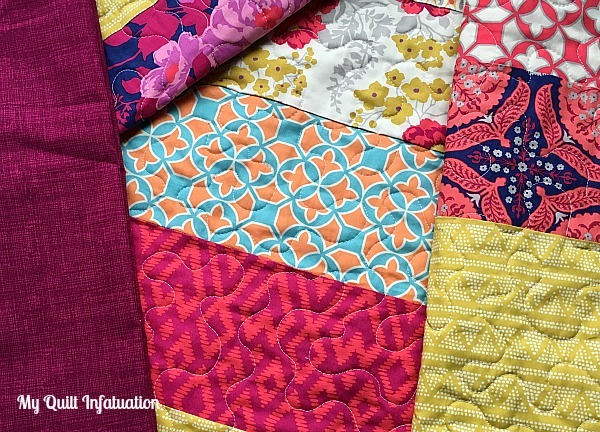 These diamonds by Sew Preeti Quilts are absolutely gorgeous! Young Texan Mama's Advent Calendar finish is too cute! I love seeing Christmas projects pop up throughout the year! 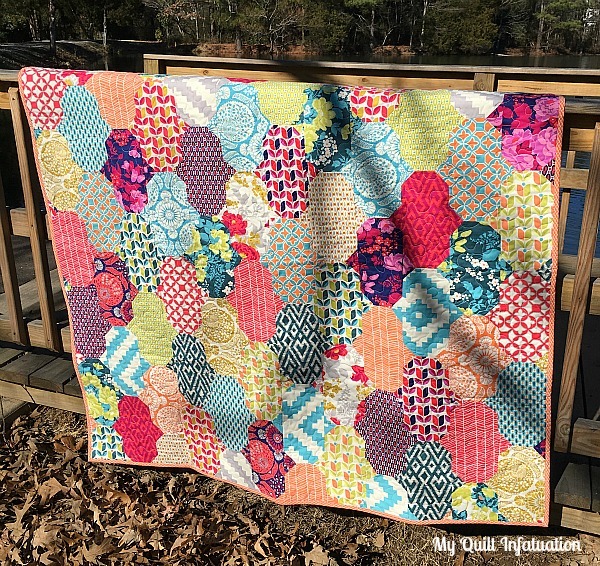 and The Easy Quilter showed off several charity quilt tops in her post, but this scrappy rainbow bowtie is my favorite by far! As far as I'm concerned, 33 degrees and drizzling is just about the most unfair weather ever. All of the bitter cold, and none of the fun (yes, my Northern US and Canadian friends, I do know that is probably balmy for some of you right now, haha!). Just one tiny degree means the difference between the nasty weather we have here today, from a beautiful blanket of snow. 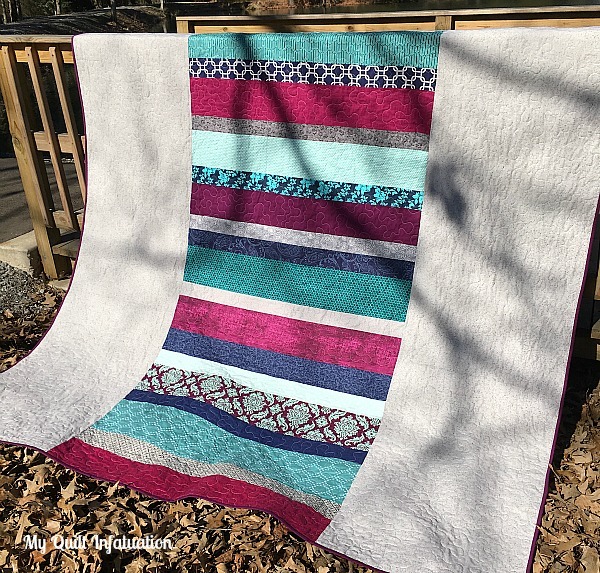 Of course, that also means the difference between a pristine snowy backdrop to show off the vibrant colors in my latest quilt finish, or dull inside pictures. Clearly, you can see what I had to go with. 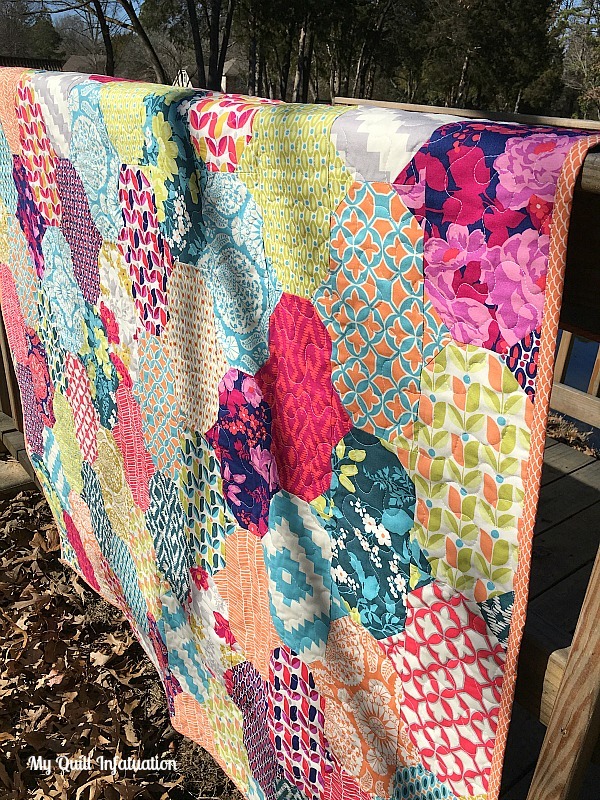 The larger-scale prints and bold colors in these Flora fabrics are so gorgeous, and I really love how the size of the blocks kept those lovely prints intact, which is always a plus. By the way, you can find the Baubles pattern in my Craftsy shop HERE and also in my Etsy shop HERE. 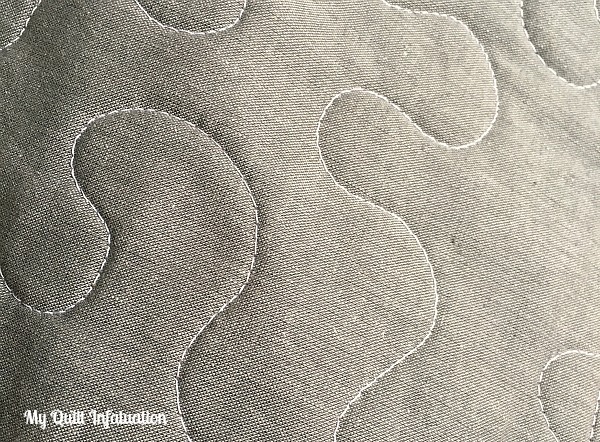 The other part of the backing that I want you to see up close is the gray fabric that I used to widen the backing. It is a Cloud 9 organic fabric, and it is a shot cotton. It's kind of like an Oakshott, but much more subtle. For those unfamiliar with the term, a shot cotton is a fabric that has one color thread for the warp (the lengthwise threads that provide structure to the fabric), and another color for the weft (the threads that are woven over and under the warp threads). When those two thread colors are very different, as in Oakshotts, the fabric looks iridescent and almost seems to shimmer, even though it is 100% cotton. It is quite striking. This particular fabric is shot in two shades of gray, so it doesn't take on the iridescent quality of an Oakshott cotton, but it definitely doesn't look flat in person. 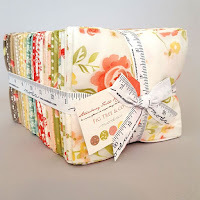 My JoAnn's actually carries Cloud 9 fabrics in their designer fabric section, and I managed to score a remnant that was just an inch shy of a whole yard! They come in several different colors, and if your JoAnn's doesn't carry them, you can find them on fabric.com and Hawthorne Threads (not sponsors, just passing on helpful tidbits). 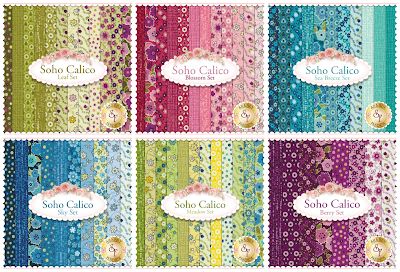 This collection of shot cottons is called the Cirrus collection. 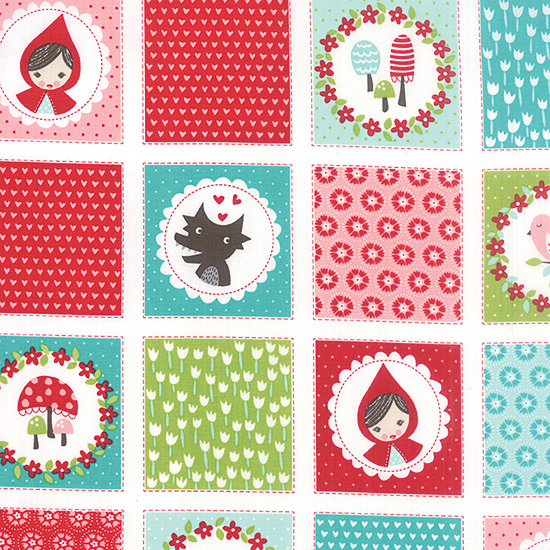 As soon as I saw the Flora fabrics and started planning my quilt, I had this fabric in mind for the binding. It is from the Fantasia line, and I thought it would be a spot-on match for the sherbet orange in these fabrics. When I saw them together, my hunch was confirmed, so I went ahead and made my binding, thinking that I was way ahead of the game. I ordered several berry colored fabrics for an upcoming quilt, and they arrived last night. As I unpacked them and laid them out right next to this quilt, I fell in love with the way the rich berry color complimented these prints. 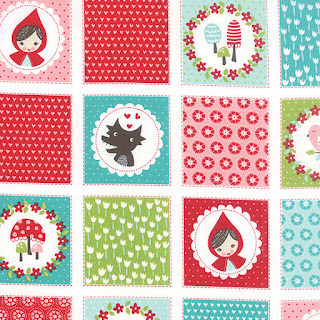 Look how awesome that berry sketch looks with the Flora fabrics! 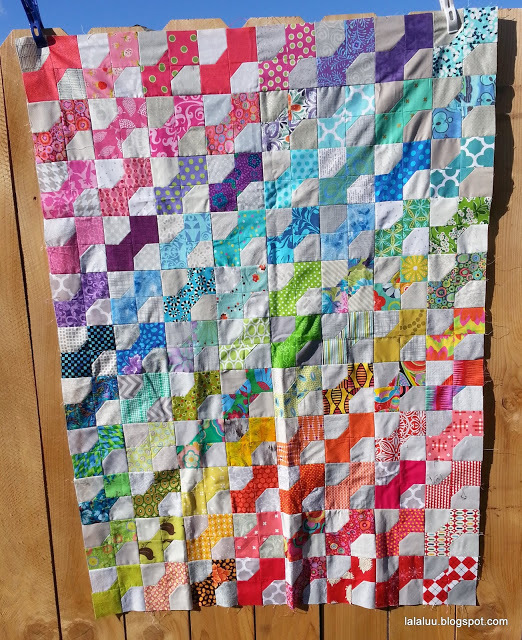 I really cursed the fact that my binding was already made, and since I don't have any upcoming quilts with orange, I knew I couldn't immediately use the binding elsewhere. 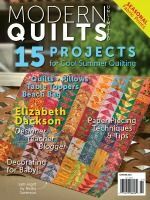 It took every bit of responsible quilter fortitude to go ahead and use that orange binding so it wasn't wasted, but I did it. 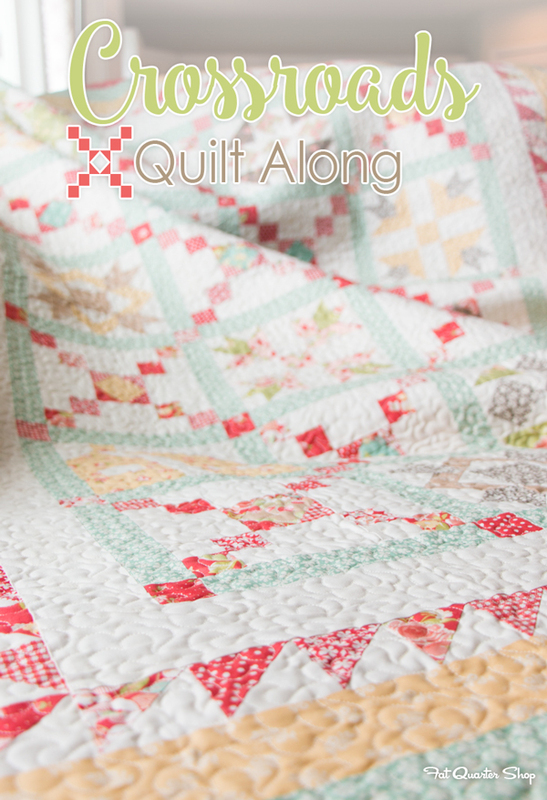 Rest assured, my next quilt WILL have a berry binding! 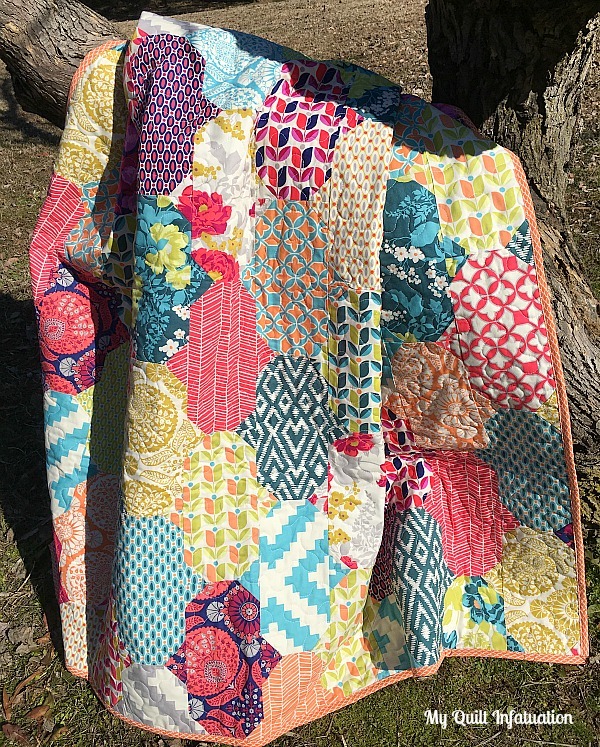 I am just itching to get some really good outdoor photos of this quilt, so don't be surprised if you see a couple of them pop up in another post! So, let's move along to last week's features, shall we? By the way, I haven't said this in awhile, if you're featured on NTT, feel free to grab a "Featured" button for your blog if you'd like! It's almost time to party! Just one last bit of business before we get down to it. There are three amazing giveaways going on right now, and if you haven't yet, you can enter HERE. Party time!! Show me what you've got! Happy Friday, all! I'm going to start this post out with a little disclaimer. 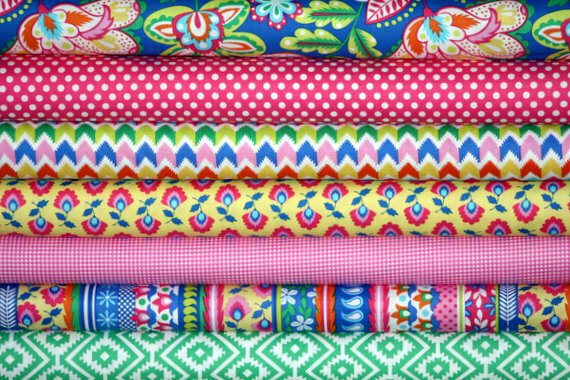 If you made a New Year's resolution to stop buying fabric, then this is probably not the post for you. The way I see it though, when amazing fabric is available at an amazing price, it is fiscally irresponsible to NOT take advantage of it. That's my story anyway, and I'm sticking to it. 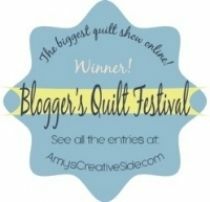 Of course, this post also includes giveaways from three amazing shops, so feel free to keep on reading guilt-free for a chance to win some quilty goodies! This post is jam-packed, so let's dive right in! 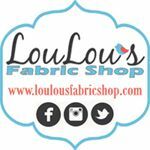 To kick off this month's post, I have the honor of introducing my newest sponsor, LouLou's Fabric Shop! LouLou's is a new discovery for me, and I can tell that I'll be visiting often! 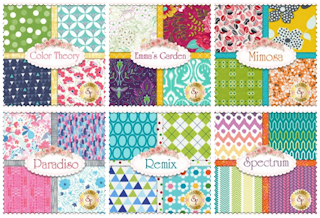 LouLou's has an amazing selection of fabrics from a wide variety of designers, including precuts, bundles, and yardage- all at great prices. *Daily Deals- sometimes the deal is on a certain product, sometimes it's on a specific collection, and other times it's on an entire category, but it's always a steal! LouLou's promotes the Daily Deal on Facebook, Twitter, and Instagram, as well as the Daily Deal tab on the shop site. Today's Daily Deal is on a FQ bundle of Lucky Star! 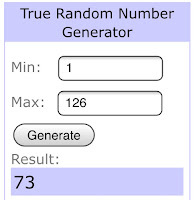 *Monthly Giveaway- LouLou's also gives away an awesome prize each month. 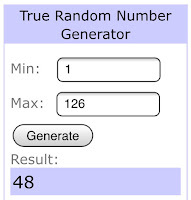 Details on entering are available on the Giveaway tab of their shop. 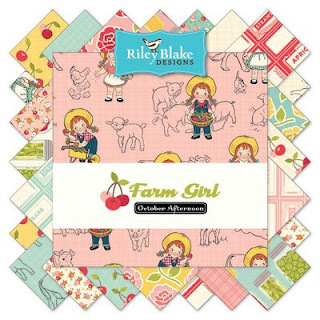 This month's goodie is a FQ bundle of Farm Girl. *Preorder Deals- you can save 10% on preorders by using the code preorder, and LouLou's even offers the option to pay in installments for upcoming collections. That is certainly unique and helpful when you know you'll want a giant bundle! All of the fantastic deals and giveaways that LouLou's offers are widely advertised on social media, so you'll definitely want to follow them through at least one of those outlets so you don't miss out! 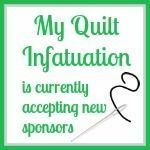 LouLou's Fabric Shop is kindly offering a coupon for 15% off for my readers using the code quiltinfatuation. 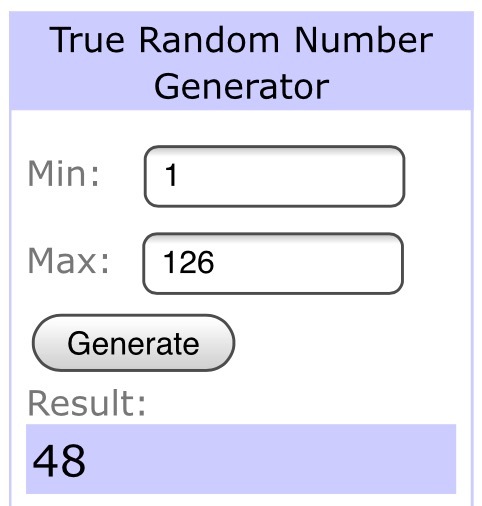 This code will be good through next Friday! You definitely need to hop over there and spend some time in this fun shop! 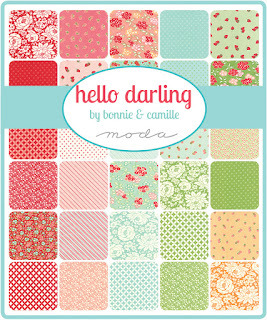 There is lots going on at Fort Worth Fabric Studio, including a couple of great sales and an adorable new collection. If you've never shopped at FWFS, you're in for a treat. There are currently some spectacular sales to be had at Fort Worth Fabric Studio. 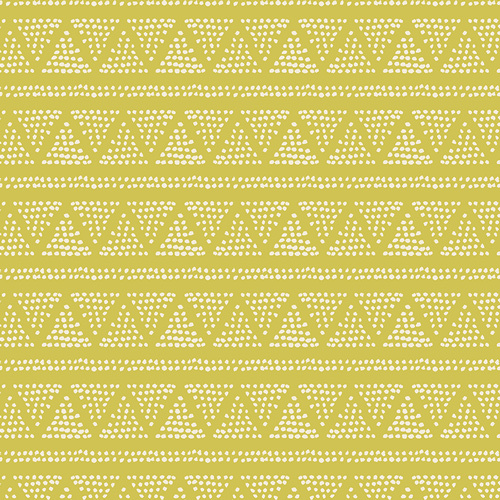 Right now, Modern Country by Wyndham Fabrics is $5.55 per yard with no code needed! These are really beautiful low volume prints. The next sale is what really has me drooling, though. 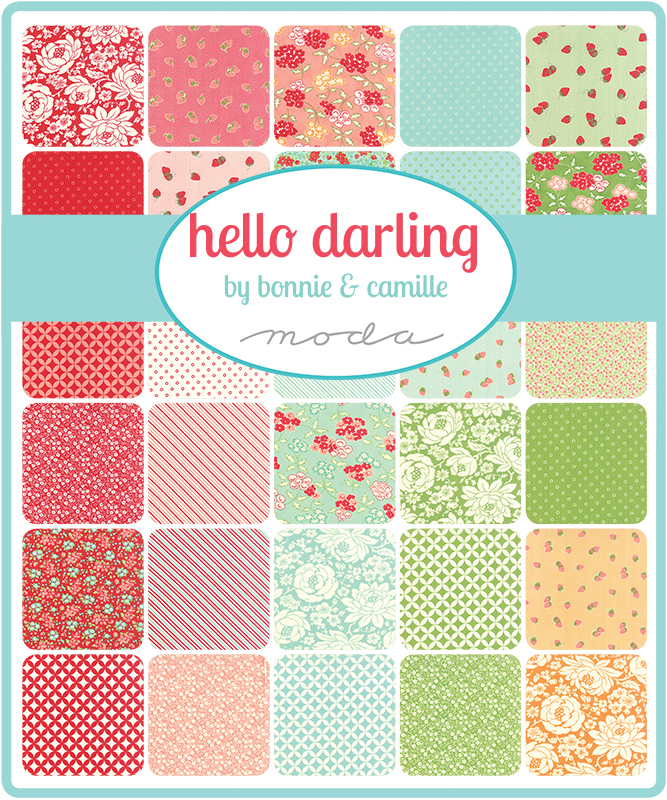 Hello Darling is 35% off from now through January 21st with the code HELLO35! 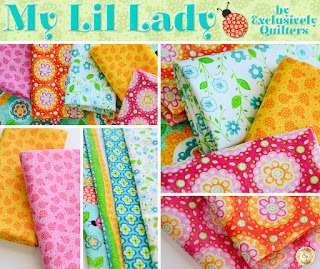 I don't know if I can pass up such a deal on these fresh, gorgeous fabrics! The latest collection in stock is Moda's Lil' Red. What an adorable collection! 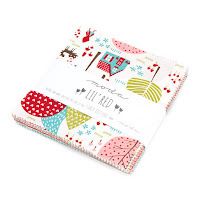 The colors and prints almost has a vintage look, which really is a perfect representation of a timeless fairy tale. So sweet! FWFS has the entire collection plus charm packs! 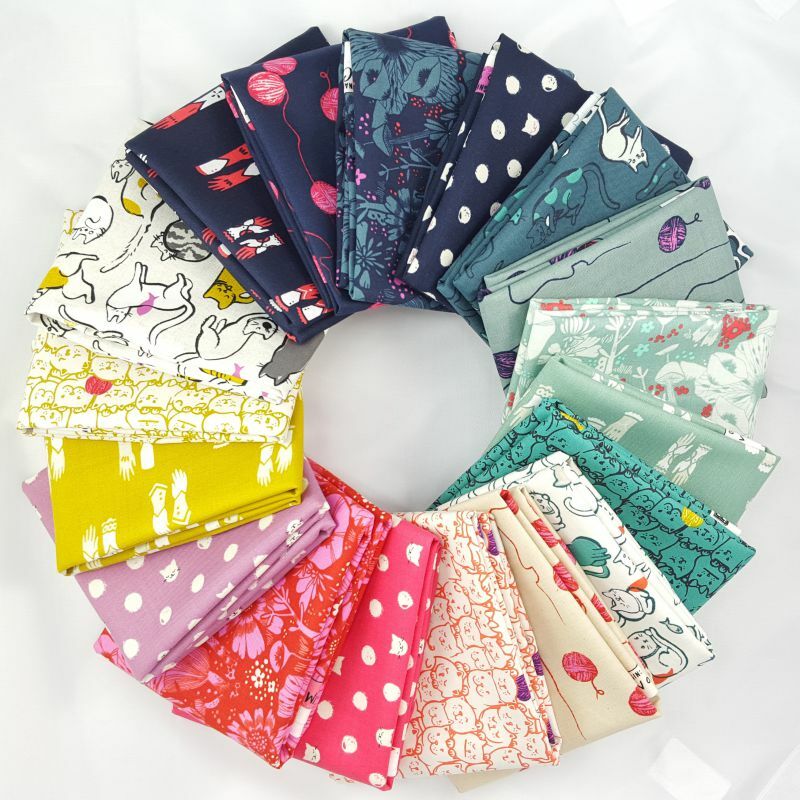 Speaking of charm packs, Fort Worth Fabric Studio is generously giving away a charm pack of the Lil' Red collection, so you can get a look at all of these precious prints! 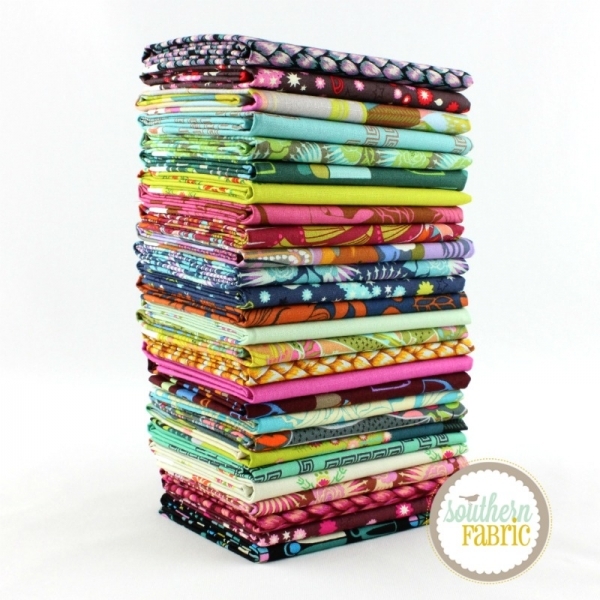 Up next is Shabby Fabrics! Shabby Fabrics has a huge selection of kits, bundles, precuts, and yardage, and their sale section is huge! 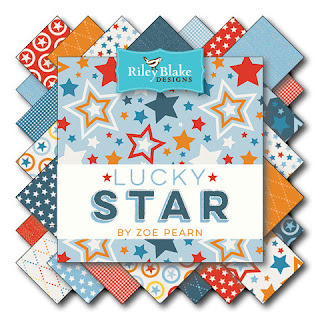 Just to give you an idea of what I mean- currently there are 87 different collections on sale- 87! I have put together a little collage of a few of my favorite lines on sale, but you can look HERE to see all 87. From this page, you can view a text or picture listing of all of the sale collections, and only look at the fabrics that you want to see. 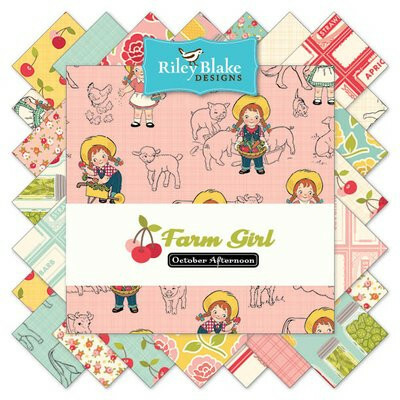 Shabby Fabrics has several new collections right now, including Farm Girl and Lil' Red, but one of my favorites has to be My Lil Lady. The colors are so bright and cheerful, and they make me long for warmer spring weather to get here soon! Another new one I love is Soho Calico. 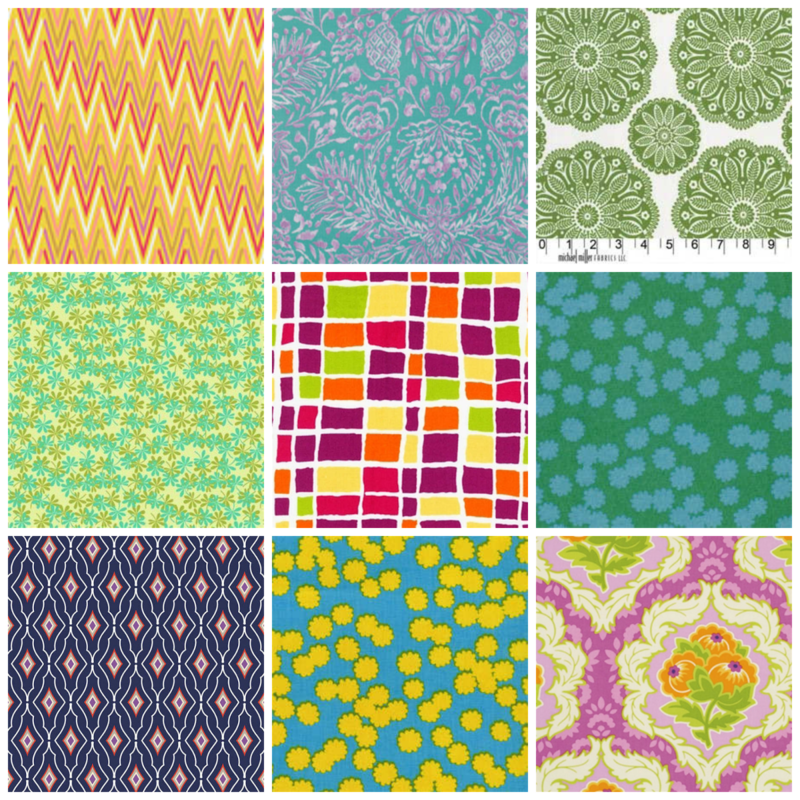 These prints are available in several rich color ways, and are a fresh take on smaller florals! Fat Quarter Shop is always full of fun news, and they also happen to be sponsoring the second giveaway of the day, so read on! 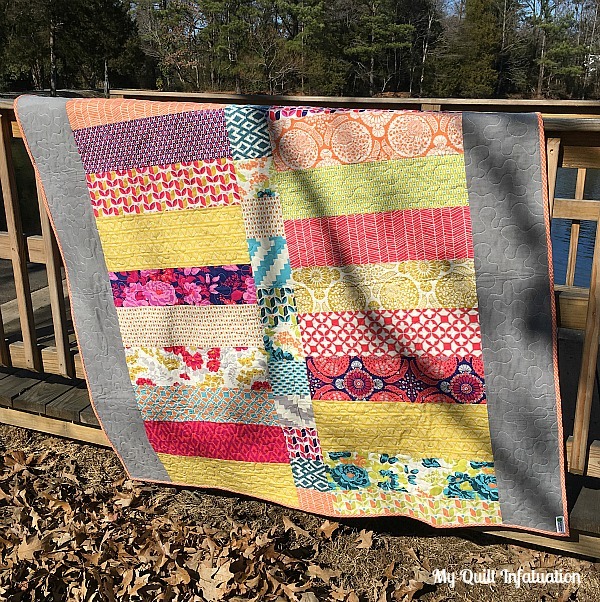 You can join Fat Quarter Shop on the Crossroads Quilt Along right now! 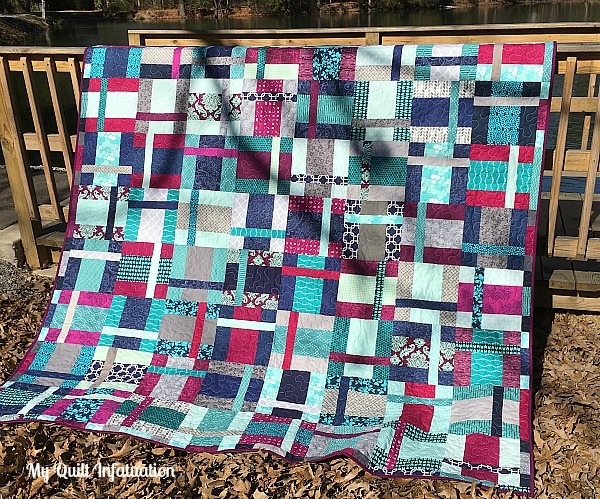 This quilt along benefits the March of Dimes, whose mission is to prevent premature births. As the mom of a preemie born at 31 weeks gestation, and weighing only 3 lbs. 10 oz, this organization is near and dear to my heart! There are a limited number of quilt kits and pieced backing sets available, using the Strawberry Fields Revisited collection by Fig Tree Quilts, so you can jump right in! If you'd prefer to use your own fabrics, that's fine too! 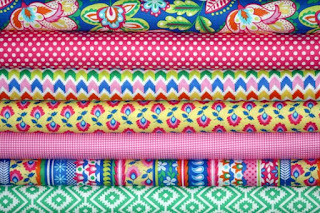 The fabric requirements are available starting today. If you're just itching to be an over-achiever, you can get a head start on your holiday projects for next year. 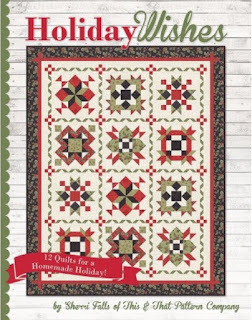 The Holiday Wishes book is available for preorder now, and will arrive in the Spring. The book contains 12 different Christmas projects for every room in your home! Fat Quarter Shop is sponsoring our second giveaway, and it is a great one! 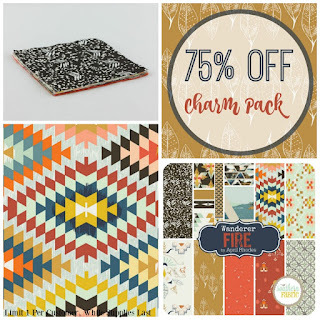 They are offering a $75 gift certificate to one lucky reader to spend however you wish! 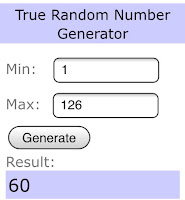 Keep reading for details on how to enter! 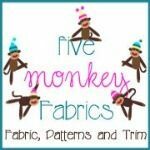 Last week, I welcomed Five Monkey Fabrics as a sponsor, but in case you missed it, I want to include a recap for you! Five Monkey Fabrics offers beautiful bundles and yardage from a wide variety of designers at fantastic prices! Their customer service is wonderful, and their shipping is quick and cheap. In fact, for all orders over $50, shipping is free with the code FREESHIP! We all love a good sale, don't we? Well, the sale section at Five Monkey Fabrics is filled with beautiful fabrics at rock bottom prices. Some of their fat quarters are only $1.50! 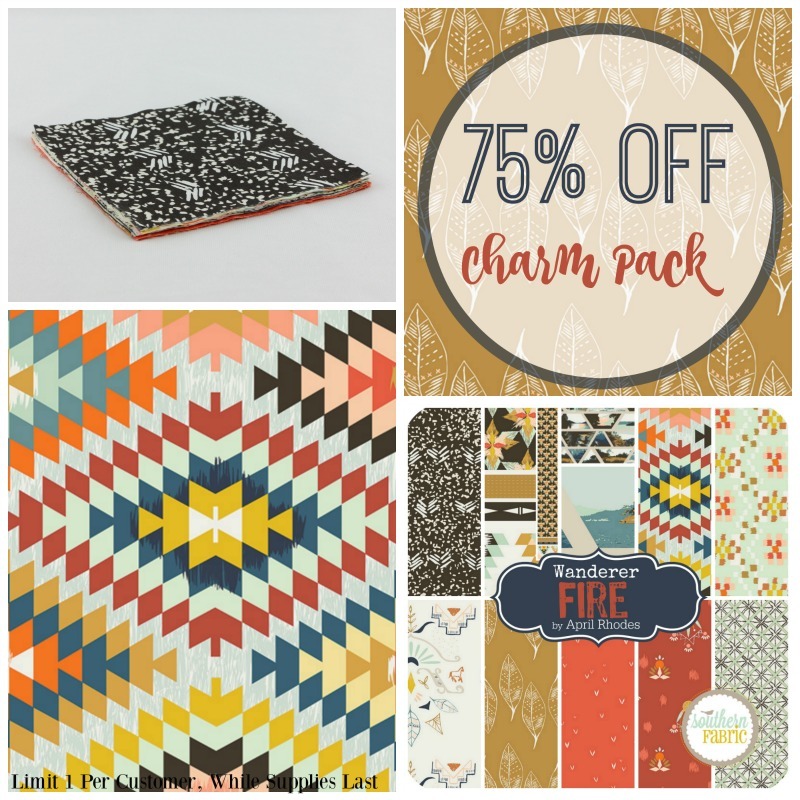 This is just a small sampling of some of the beauties that are available in the sale section! You really need to check it out! 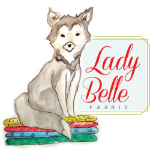 There are plenty of happenings at Lady Belle Fabrics as well! 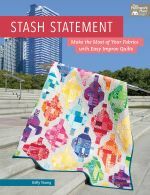 The latest collections include the brand new Cotton and Steel Cat Lady, as well as Fig Tree's Strawberry Fields Revisited, and sweet Lil' Red (including the doll panels!). Lady Belle is also extending their offer of free shipping for US orders with the code freeship for another week, so definitely take advantage of it! prices that you just can't beat! Don't miss out! Last, but certainly not least, is Finer Ribbon. You all know how much I love my custom labels. 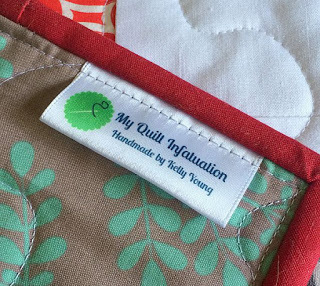 I love the professional touch they add to my quilts, and designing them couldn't have been easier! These labels are full color, machine washable, and very soft! 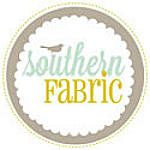 The designers at Finer Ribbon worked with me to make sure that my text and logo appeared exactly as I envisioned. In fact, they even sent a proof that was perfectly to scale. I was able to print the proof, cut it out and fold it, and see exactly how my labels would look before printing! The labels I ordered are listed HERE, but please note a couple of important points. *My labels are 2.25 inches wide. 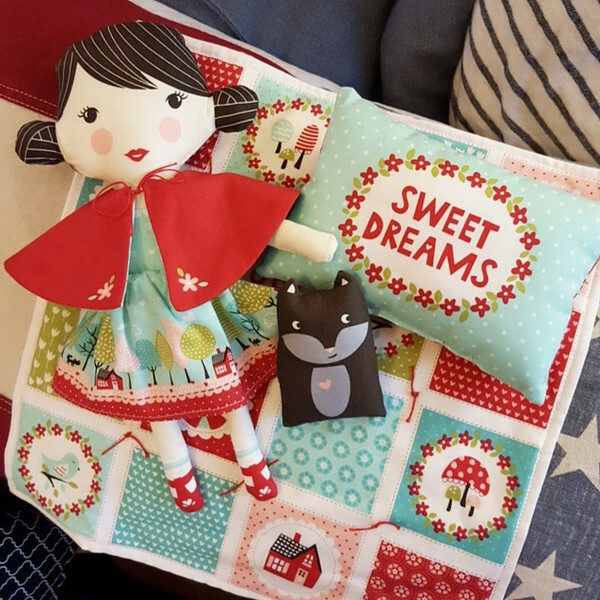 You have to select the size you want, as the smaller sizes won't really work for quilts. 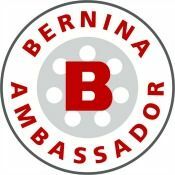 *My logo and text are printed from side to side on the ribbon, rather than running the length of the label as shown in the example on the website. 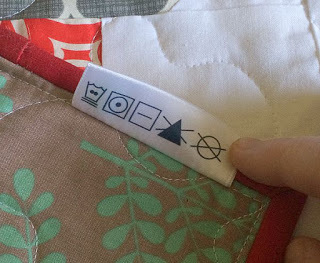 Having the label printed from side to side allowed me to utilize the space on the back side of the ribbon for laundry care symbols! The spool of labels includes lines for cutting, so when I'm finishing a quilt, I can easily cut one off and sew it underneath the binding on the back side. There are 1000 labels on one spool, so that works out to less than 10 cents per label. Even if you know you could never use all of them, that's still a great deal! 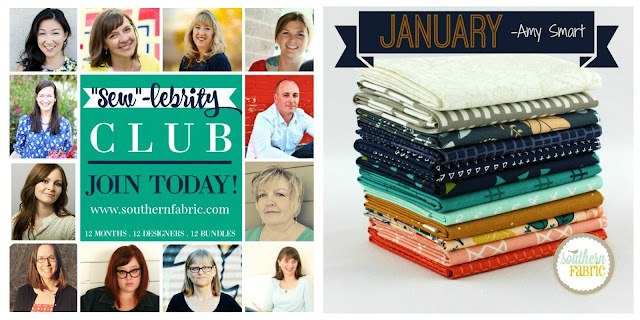 Finer Ribbon is sponsoring the final giveaway of the day, and it is a doozie! 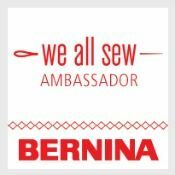 They are offering a $100 gift certificate to their shop! 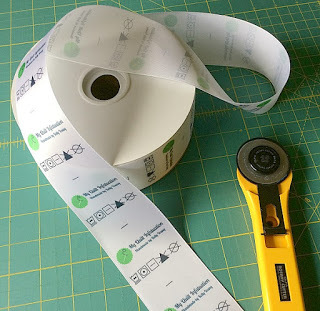 You can use it on a spool of labels, or on any of their other products! 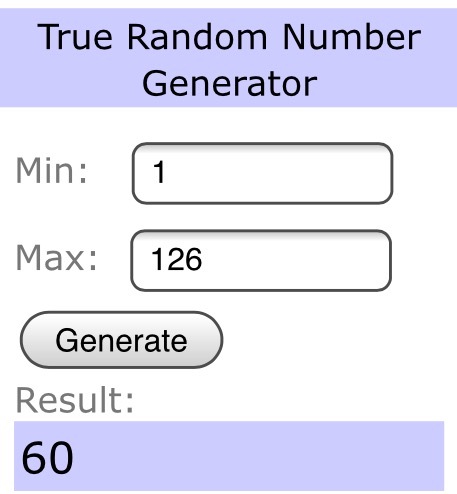 So, with all three of the giveaways from my generous sponsors, I know you all want to know how to enter! Well, it really couldn't be easier! Just leave a comment on this post to let me know what bit of quilty goodness has really caught your eye! Please be sure you leave an email address so that I can contact you if you are a no-reply blogger! 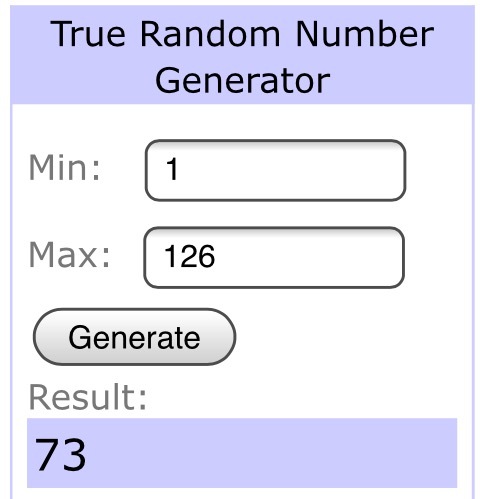 I'll announce the winners next Saturday morning, 1/23. Good luck to all, and happy shopping!